Road safety doesn't just apply to cars and adults who drive them. Even kids must be aware of traffic safety issues and take steps to remain safe whenever they are on or near a road. Following specific rules regarding pedestrian, bus, railroad track, and bicycle safety will help keep them safe when they are playing or even just walking home. Parents or guardians should begin teaching their children how to be safe in traffic situations from an early age and should become good examples by following the rules themselves. Kids who understand how to be safe near traffic will also learn to develop a respect for safety issues and will likely continue that safe and responsible behavior in the future when driving a car as an adult. Annually in the U.S. there are over 600 children who die as a result of a pedestrian related injuries. For this reason, parents must make every effort to teach their children how to be safe when walking on public and/or private streets. There are many threats to children as they walk, regardless of whether they are on neighborhood sidewalks or in a parking lot alongside their parents. Most children who are below the age of ten should ideally be with a parent or adult when crossing the street. This is because children within that age group may not properly judge the speed in which a car moves and may, as a result, use poor judgment when it comes to traffic safety. Instruct children to only cross at a cross walk and to look for the presence of oncoming vehicles before stepping into the cross walk. The proper way to look for a car is to look to the left, to the right, and then back to the left again. Only when there are no signs of an approaching vehicle or if a vehicle has stopped at a stop sign, should they move forward. It is important for them to continue looking as they cross, in the event that a fast-moving car approaches. Parents must also advise their children to never assume that a driver sees them or that they will stop. Playing and running into the street should also be strictly forbidden. When walking, children should walk on available sidewalks. If there are no sidewalks then the child should walk as far to the side of the road as possible and face oncoming traffic. They should never walk with their backs to oncoming traffic. 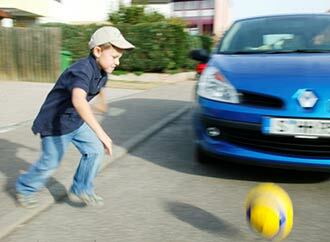 When walking past driveways, instruct children to look for signs that a car is backing out. Bicycles and childhood often go hand in hand. During the warm weather months, bikes provide kids with a fun way to exercise and enjoy time with their friends. With bicycling there is also the risk for serious injury, particularly if kids are not practicing bicycle safety basics. Choosing a bicycle that is suitable for the child's age and size is one of the first safety steps to take. Following that, kids will need the right type of gear and accessories. This includes a helmet that is well-ventilated and fits properly. A helmet that meets the Consumer Product Safety Commission's, or CPSC, standards will protect a child from head injuries that could result in a disabling injury that causes brain damage, or even death. The helmet will have a CPSC sticker inside and it should be fastened and worn correctly at all times. In addition to a helmet, children should wear clothing that is bright to help make them more visible. At least one item of clothing should have some form of reflective material on it. Learning and obeying all traffic laws is also an important aspect of bicycle safety. Before allowing kids to bike alone or with friends, kids should be knowledgeable about street signs, traffic lights and pedestrian lights and what they mean. They should also ride with traffic at all times, making sure to stay within the designated bicycle lanes. Parents should also teach their children the proper use of hand signals and look before making turns or stopping to safely alert other bicyclists and vehicles sharing the road. When discussing kids traffic safety concerns and rules, it is important to also discuss school buses. At almost every school, school buses are a common sight, whether dropping kids off to school, transporting them to games, or field trips, or taking them home. These buses are potentially dangerous to children who ride within them and even children who are outside of them. The threat that school buses represent can be lessened if kids obey certain rules when in the presence of a bus. Prior to boarding the bus, kids should stay out of the street and remain on the sidewalk as it approaches. They should not play in the street or anywhere near the approaching bus to avoid falling or being pushed accidentally in front of it. Ideally, kids should line up in an orderly manner and await its arrival. While on the school bus, it is important for kids to remain seated at all times until the bus comes to a complete stop at its final destination. Roughhousing, screaming, or throwing objects is not acceptable behavior as it can not only injure fellow passengers, but is also distracting to the driver. Kids should also never put their heads, hands, or feet outside of the bus windows at any time. Once the bus has stopped at its destination, students must wait until it has come to a full stop before disembarking. If the student must cross the street, he or she should walk ten feet ahead of the bus on the sidewalk. Once the driver is in clear view, the student should wait for a signal from the driver before crossing. As with any other time, the student should also check for oncoming traffic and ensure that any cars have come to a full stop before crossing the street. Railroad tracks may not be the first thing that people think of when talking traffic safety, but they are something that people should talk with their children about. Kids should be taught never to play, sleep, walk, or ride their bicycles on railroad tracks. Although trains may not seem fast, they move at speeds of 65 miles-per-hour or more. They also can take over a mile to stop once they identify that there is someone on the track. Kids should first recognize that train tracks are private property and that playing on them is considered trespassing and against the law. They should only cross tracks at the designated crossing. If there are red flashing lights, a lowered gate, or both, no attempt should be made to cross the tracks as the lights and the gate indicate an approaching train. Only when the flashing has stopped and the gate has lifted should kids cross the track. Playing alongside the tracks should also be discouraged as debris and even parts of the train itself may fly from beneath the train as it is passing, resulting in injuries.